Everyone at this company has a vision, eye for detail, product knowledge, long-term motivated goals & values, and have a genuine interest in performing their best. Call us today to see the difference! Our firm's primary goal is to create a holistic connection between our client's needs and the site. 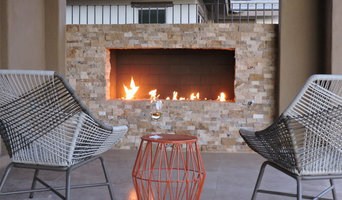 We create useable, friendly, and beautiful spaces that are easy to maintain and enjoy. Our daily goal is to continually provide superior service and create beauty in our Arizona landscape design and installation work. We are a family owned and operated landscaping services & irrigation design business in Phoenix, AZ. Think Green Irrigation & Landscaping contractors has been serving the Valley of the Sun since 2000. Greey|Pickett is a professional firm comprised of landscape architects, urban planners, artist and talented production staff. Greey|Pickett was formed in 1997 by Russell Greey and Wendell Pickett. At Azul-Verde, we pride ourselves on being the most creative and cohesive developer of outdoor living spaces in the Valley. We work to meet all of your landscape needs. Our clients are our top priority and we are committed to collaborating on every step of your project to ensure that we provide exceptional results. BLACKHAuS Design is a full service site design & landscape architecture firm specializing in residential site design, resort planning, technical drafting / detailing, & installation management. Sustain Scape is a full service landscaping company offering designs, installation and maintenance with an emphasis on sustainability. Master landscape and pool designer, Kirk Bianchi, elevates outdoor living to an art form, for the ultimate fusion of total outdoor lifestyle design. On Site Landscape designs stunning, customized scenery that is perfect for entertaining guests or a peaceful night at home. Our design experts transform lawns into vibrant scenery. Trademark Landscape, a division of Trademark Companies, Inc., was established to design, build and maintain custom landscapes to fit the lifestyles and environments of their discerning clientele. At Modland Design Llc., we look at the natural aesthetics, understand the context, and collaborate with the Client and all who are involved to shape the vision of the project. Sonny Moric, the president of smART Development Landscape Architecture, is a registered Landscape Architect in the State of Arizona. Sonny and his design team have been assisting the home owners, contractors, developers, and real estate agents with their landscape projects for over a decade. His educational background in landscape architecture and planning, his national certification, and his experience of looking at the projects with a careful design eye and special attention to detail result in beautiful, creative, and unique projects that are custom design based on the individual needs and budgets. smART Development Landscape Architecture can create design for a fee but can also help with the bidding, project management, and installation of your project. 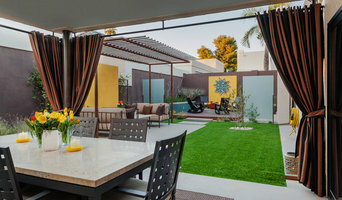 Sonny is well connected with reputable Landscape and Pool contractors in your area and has designed and helped install hundreds of projects in the Phoenix Metro Area. The companies he works with have been carefully screened, are licensed, bonded and insured, and have great reputation and rankings at the BBB and AZROC. Even the most beautifully designed landscape projects can turn into a challenge if not executed with the same attention to detail on the field. Sonny continues involvement in the process from the design through the construction phase will result in your project being installed correctly, on time, and on budget. Nanette brings a unique approach to landscapes in the desert, pushing the envelope using site architecture to compliment rare and colorful plants. Impeccable landscape installations are also offered. Professional landscaping anchors a house to the site, connects it with the environment and creates a welcoming entrance to a home. A Fountain Hills landscape architect or designer works with living plants as well as building materials to design for future growth and maintenance as well as the present visual appeal. Landscape architecture is very regional, so look for a landscape designer in Fountain Hills, AZ that’s familiar with the local climate and plant types that do well there. Start here to learn more about the landscaping services in Fountain Hills, AZ that will help create your dream garden. The work of this outdoor professional includes most everything surrounding a home's exterior. A landscaping architect can even work with the home architect to choose the right spot for your Fountain Hills, AZ house. From there the Fountain Hills landscaper will develop preliminary concepts for your front or backyard design based on individual needs including the climate and activities that will take place, as well as layouts and planting plans. Landscape architects will also design any structures or outbuildings that will be added to the space. Any grading changes that will be added to the yard are also the responsibility of the architect. This includes any drainage modifications. An engineer can also be responsible for these tasks, but licensed Arizona landscapers are fully capable. Like building architects, they will produce preliminary concept drawings as well as detailed construction documents and planting plans. Three-dimensional renderings and illustrative plans are all supplementary. A Fountain Hills landscaping designer generally will have ecological, aesthetic and technical training, which helps them maximize the potential of your outdoor space. Keeping in mind both style and functionality, garden designers analyze your architecture and yard to produce a plan that may or may not include location and materials for walkways, patios, water features, fences, garden aspects and more. In addition, a landscaper in Fountain Hills, AZ will carefully assess your geographic region to choose plants, trees and flowers that will flourish naturally, as well as address concerns such as drainage, screening and soil conditions. Certain landscape designers only help with the planning portion, while some may deliver the plans and then oversee a hired landscaping contractor. Others — typically following a design-build approach — take care of both the design and all aspects of the landscape architecture and construction. Before you hire an Arizona professional landscaper, consider the scope and emphasis of your outdoor project. Landscape architects, who typically hold advanced degrees in their field, are trained to develop comprehensive structural plans that include plants, hardscaping, water use, drainage and more. Landscape designers typically specialize in the aesthetic and horticultural, rather than structural, side of yard and garden planning. They might or might not have advanced training. Even within their fields, a garden designer may specialize in hardscape- or vegetation-focused designs. In some cases you might need to hire additional help to get the outdoor space you want. Here are some related professionals and vendors to complement the work of landscape designers: . Find a Fountain Hills landscape architect on Houzz. 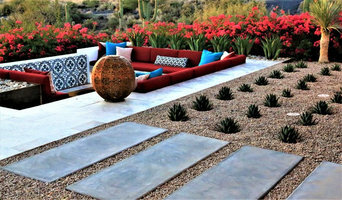 Narrow your search in the Professionals section of the website to Fountain Hills, AZ landscape architects and designers. You can also look through Fountain Hills, AZ photos to find a space you like, then contact the professional who posted the photo.